I was recently given a suggestion/request to do my next post on detoxification. While I always love requests, I especially love when they are as good an idea as this one. Think about it, almost every hit diet has at least a few days of detoxifying in the beginning. Typically, this means stripping the diet down to the bare essentials to cleanse the body of simple carbohydrates, salts, refined sugars, etc. The body does this by purifying the blood in the liver and releasing toxins through the kidneys, lungs, intestines, and skin. So, if every hit diet is doing it, there must be something to it, right? So how do I detox? Everybody will be different in his or her detox program, which is why you should always consult a doctor before you ever begin one. With that being said, here are some typical ways in which people can begin a detox program. 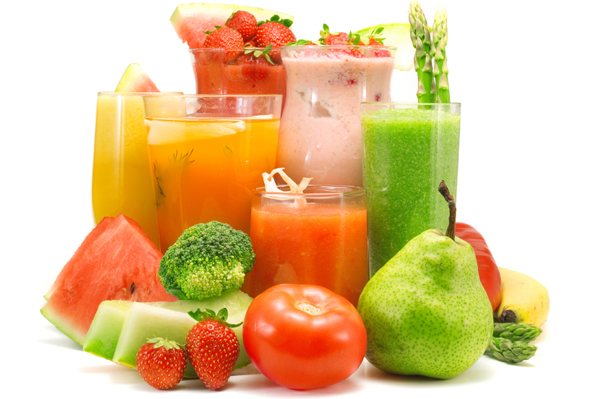 Rid your diet of harmful toxins: This includes caffeine, tobacco, alcohol, refined sugars, saturated fats. –Quick Fix: Try to avoid eating processed or refined foods as they often contain sugars and saturated fats. Also, avoid using salt or anything containing high amounts of sodium for a bit. Drink lots of water! Limit the stress: Okay, I know this one is easier said than done, but stress produces adrenaline in the body, which in time can become rather harmful and reduce your ability to detox. –Quick Fix: Don’t sweat the small stuff! Engage in regular exercise or meditation sessions such as yoga to calm your nerves and sweat out the stresses. Drink at least two quarts of water daily: Water can flush out your system by releasing most toxins through urination. Not to mention the benefits water has on our skin and mind! –Quick Fix: Buy a BPA free, reusable water bottle of a certain size. This makes it easier to keep track of how much water you’ve had by how many times you’ve had to refill your water bottle! If you’re not much of a water drinker, add sugar free flavoring! Exercise: As mentioned earlier, exercise helps to reduce stress, but it also provides countless other benefits. It helps individuals to sweat out toxins and see positive results in body shape and weight. These positive results can boost an individual’s self esteem which does wonder for the body and mind. –Quick Fix: Find an exercise that you love and will stick to. Burning calories is burning calories and as long as you’re moving, you’re ridding your body of the toxins. Eat plenty of whole and natural foods: This includes fruits, vegetables, whole grains. –Quick Fix: When buying foods, turn them over and read the label. If you can’t pronounce an ingredient, don’t buy it! Whole and natural foods have no artificial or fortified ingredients (or they wouldn’t be natural). The benefits of a clean diet are endless. You can ultimately cut down on your risk for several diseases such as heart diseases, cancer, diabetes, stroke, and more by ridding your diet of saturated fats, free radicals, sugars, and high blood pressure causing foods. Remember, a strict cleanse isn’t meant to be followed for the rest of your life, but rather a few days to a week. (Or for however long your doctor recommends). However, eating clean, whole, and natural foods is a diet you should follow for the rest of your life. Every once and a while though, it is good to have a piece of chocolate or indulge in the things you enjoy. Just don’t over indulge!! This entry was posted in Nutrition Facts and Tips and tagged de-stress, detox, Diet, energy. Bookmark the permalink.